Yasuda Suzuhito will be the character designer for the up-coming Digimon Story Game, we shall all lookforward to his design, since he did an amazing job on the previous Digimon World game. 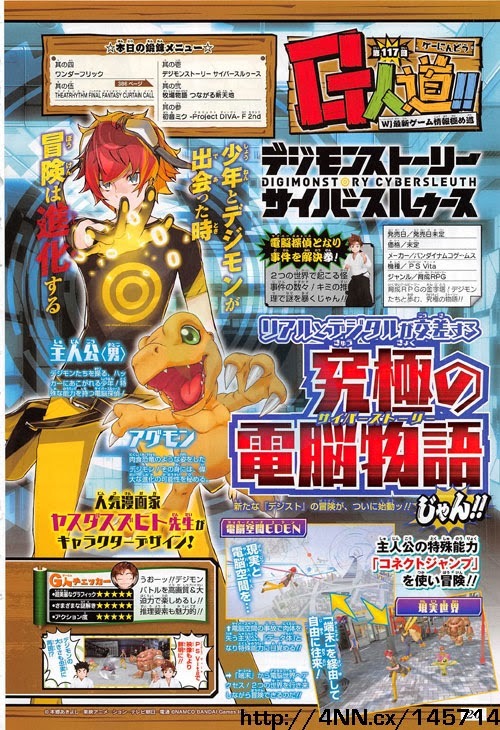 Protagonist is male, that has controls the Digimon, with a special ability, a computer(digital) detective that search for Hackers. The protagonist enters Digital World, loses his physical body and becomes "Data Body", and awaken his special ability. Hmmm. Slight shades of .Hack to me. Perhaps BAMCO has been taking cues from it for this game's setting? Aegiochusmon's 5'th form, the holy species form debuts in this months vjump. Is there an image yet? His stance reminds me of ShineGreymon. And I'm not sure whether I'm surprised or not. After a line in a cutscene said Aegiomon evolved to Jupitermon, I thought that maybe Jupitermon was supposed to be Aegiochusmon Holy. This one looks pretty cool, much better then Dark. it also has Jupitermon's red halo thing above it's horn which also has lightning coming out of of it? Huh we gave the same image xd. Anyway more scans from 2ch. Looks the same as the scan from wj. is possible if at least 3 years have passed since the last series. since the period is. Will there be a Digimon season 8? Actually, now that ONE BILLION PEOPLE have asked that question on blogs and discussion forums, there will be! Congratulations, YOU made it happen! I love Digimon anime series very much especially adventure 01,adventure 02 and Digimon frontier..hope season 8 coming soon...do you know the story will be? Yes but I’m keeping it secret for now. Two new screenshots, plus art of the protag. Weird how the games website hasn't been updated in over 2 months. Hopefully they' d update after this month's V-Jump article. Do you mean that it's one of the Agumon from the Digimemory? If that's not it, then could you explain please? Pics from vol.2 special anime edition have surfaced, see em here. The designs of Hackmon's evo barely changed and the Musketeer mon looks exactly the same minus the red parts, really dissapointed since to me the face of Hacks evo and the Musketeer look ridiculously ugly. A new Bantyomon has been revealed for Collectors, it's a Mamemon. I like it but at the same time im'm, kinda dissapointed. That poster on 2ch was right after all. Cute banchous seems to be a trend recently. Mako Makanshoku of Kill La Kill seems to be a starter. I'm talking about this new Bantyo, the guy on 2ch said there was going to be a new one. Also another new mon has been released for Crusader, a new form for Jupitermon. Is this vjump? i'm barely half awake so yeah. I think it is more of Famitsu, judging by its layout. AAAniiimeeee!!!! Urgggggllmmsksadddweff................. I freaked out no worries guys. But still... New Anime... NOW!! Thanks. 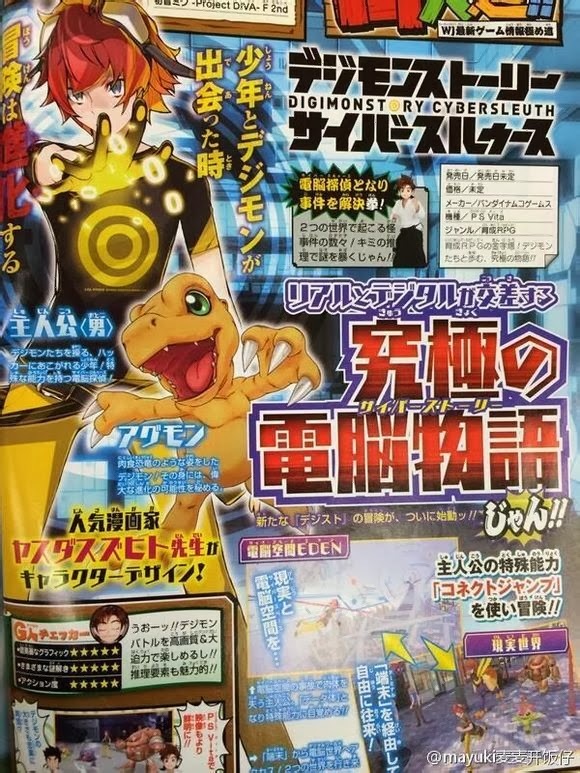 Also, Did this month's V-jump never had a Digimon Navigator page? Don't think there are any scans of this months Vjump yet, at least i haven't seen any. Oh my goddess, it's a goddess..... Junomon has been revealed. She has Jupitermon's hallows and has what look like feathers?, maybe scales on her cape? plus there are other other things there to. Sleeeeeeeeeeeeeeeep. oh and this is Collectors info, not Crusader. What is this for? If not for crusader? Collectors. Though Crusader also updated with a Junomon event on the same day, so for both now. Just noticed i spelled HALO wrong.